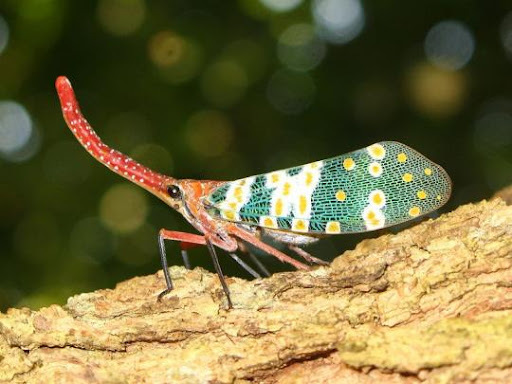 The LANTERN BUG, properly Pyrops candelarius, is an insect in the order of Hemiptera, native to southeast Asia (Laos, Thailand, etc). Not the legends about it, nor a certain popularity among collectors made me choose this little animal as my mascotte, but simply (and "outsider-ly") its particular and lovely snout ad its wings, garishly patterned with bright and contrasting colours. I sighted it while looking for some photographic material to study for an enthomology test I had, and since then I totally fell in love with it and its adorable snout. Probably all the ideas of a sane handmader you had built up up to now have just been infrancted. But I'm conscious of it, 'cause it happens when you have a weakness for strange little creatures!